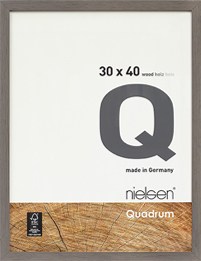 Think nature, design and quality workmanship… The Quadrum wood range is the perfect choice for rustic interiors. Think nature, design and quality workmanship… The Quadrum wood range is the perfect choice for rustic interiors. Available in 21 sizes, 20 surfaces and 3 wood veneers: oak nature, maple and wengé. The high-quality rear panels have torsion springs and edge-ground floating glass. Frame pictures in a readymade frame with a big rebate, allowing the use of double mats and laminated posters. This is a frame that will stand out.